I'm not a computer geek, so I have no clue. This is what happened. I went to export a skybox, but it didn't put me in the normal cubemap mode when the menu came up like it normally does. After exporting and closing the export menu, that's when it put me into cubemap projection. Upon switching back to normal, I realized planets have no surfaces and only their atmospheres are visible. A quick restart of the game fixed it. Not sure if this has been stated already, but after installing the new update (to a new instance) i load in a couple of ship mods - they don't matter since i haven't had the chance to use them yet - but i noticed a new ship in the very lovely new build menu (i must say, i like having tabs) - it was a vanilla ship - i spawned it in, and i could see the back of it for half a second then the game crashed. I reloaded the game, went into the ship menu, saw that it was still there, selected it, looked at it (it was fairly far away, so it was only a reflective shine sprite) and approached it. when i got close enough to see it, it instantly crashed the game. I have a Fatal1ty motherboard (surpasses recommended specs) a 960 OC gtx (same) and 8 GIG of RAM. could you tell me if this is on my end or if it is the game? I can't find a crash log. anywhere. What is the ship called? 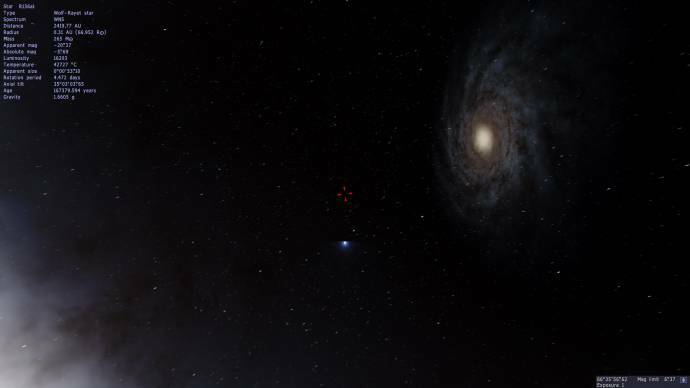 could you please provide your se.log, found in spaceengine system/ directory? Even if you didn't use the ship mods, SE checks/loads their components anyway, and if there's something wrong it could lead to unpredictable results. Unfortunately, I can't remember the name of the ship. It was in the vanilla tab, and I think it had something to do with 2 or B after the ship name (like a mk2 or II - something like that. Unfortunately I cannot remember, and I won't be able to check for a few days, I have things which must be given more priority. I will try to look for the log when I next have enough spare time, though that will also be impossible to do for a few days. 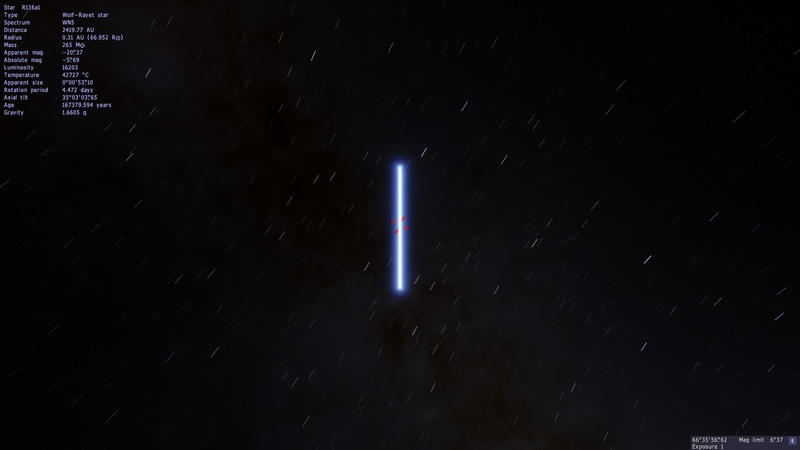 I found a glitch with this star. Upon typing it into the search menu, the star is an infinite distance away and infinite mass. On the interface, it shows a distance of 58.28 ly away from Earth, even though it isn't. Also, all 8 of its planets and their moons are frozen oceanias and are out of order in the planetary system interface. Dwarf moons are frozen asteroids. Would not recommend flying to it. I typed in HD 46588 and it was totally normal for me. How do I fix it? What do you need to know? And does anyone else have the same problem? I just placed the name you provided, RS 1374-283-0-0-258, in "Find object" window, and SE took me at the system barycenter. As for the image, like HarbingerDawn said, there's a "no more than 600Kb" policy as stated near the attachment button, probably your image was bigger so it was automatically ignored. It happens a lot to me. Now i understand... I wrote whole the time only RS and tried to find it in the list but it works only if i write the whole name. Thank you! PS: Hmm its not the same place. This here is the place i am looking for "RS 1374-283-0-0-258 BB" or "RS 1374-283-0-0-258 BAB" with 3 black holes and one sun but it says object not found? Hmm its not the same place. This here is the place i am looking for "RS 1374-283-0-0-258 BB" or "RS 1374-283-0-0-258 BAB" with 3 black holes and one sun but it says object not found? 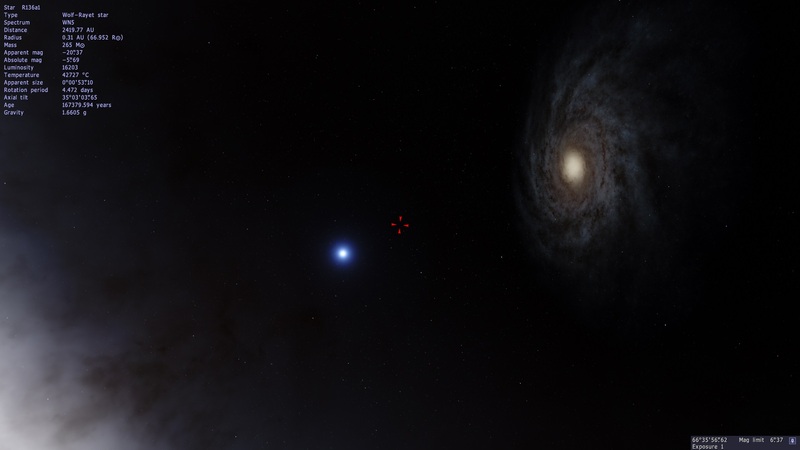 These numbers are only valid for the SpaceEngine version of which they are derived. Yours is, if I am not mistaken, of SE 0.973. In SE 0.974 RC2 is the system, if it still exists, a different system. i actully get the same problem as he said. maybe its related to mods? but not sure about it. only things i use is rodrigo-klud and plutoniam palettes. maybe its related to mods? I don't have any mods installed, so it can't be. I have the same problem with HD 46588. According to spanish wikipaedia, it should have a brown dwarf as companion, and it's indeed in the catalogs/stars/BrownDwarfs-bin.sc 0974 catalog file as StarBarycenter. But I don't see a corresponding entry in catalogs/planets/BrownDwarfs-bin.sc nor anywhere else. This could be the problem, I guess. If that's the case, a patch will solve the problem. If only some of us has the issue, though, I wonder if the reason is completely different. If I get far from this star, some glitches appeared. R136a1's Real position and apparent position looks different. and it looks moving fast in zigzags when I rotate it. *waves left arm in a semicircle* this is not the place you are looking for. In all seriousness, I noticed the same thing when I was on last. Not sure why.